Perfect for anyone who wants additional storage capacity without great effort, this Western Digital 250 GB hard drive is speedy and well-constructed. Small business owners and power users alike are attracted by the operation and specifications of this Western Digital 250 GB hard drive. The Western Digital WD2500YD-01NVB1 is a compelling device for upgrading to a better hard drive. Since the Western Digital WD2500YD-01NVB1 comes with an awesome 7200 RPM disk speed, you can backup lots of videos, documents, and MP3s in mere moments. Because this internal 3.5-inch hard drive comes with a 16 MB data buffer, you can eke out impressive system performance when you're transferring data, watching videos, or loading software. 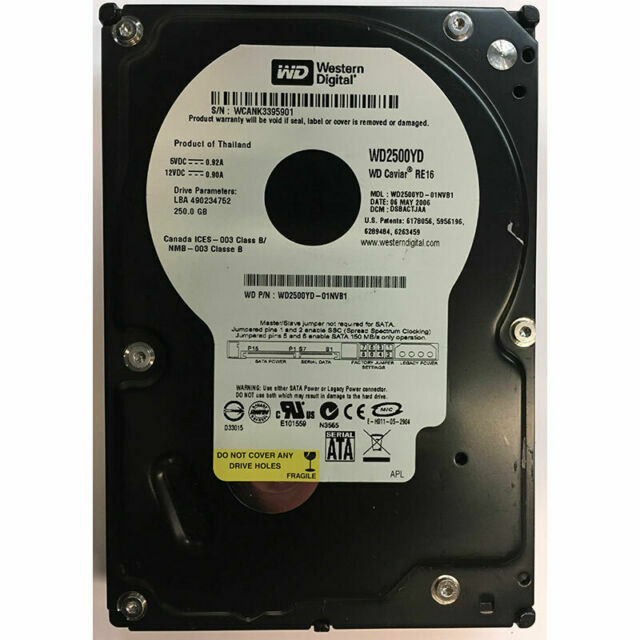 This Western Digital 250 GB hard drive is easily installable, which means you are able to quickly make the most of it in systems supporting the SATA II standard. This internal 3.5-inch hard drive comes with ample storage space enabling you to keep all your cherished digital music collection, digital camera pics, and software utilities with ease. In addition, the Western Digital WD2500YD-01NVB1 is highly reliable, with solid construction, allowing you to enjoy long-lived maintenance-free uptime without fear of data errors or component failures.